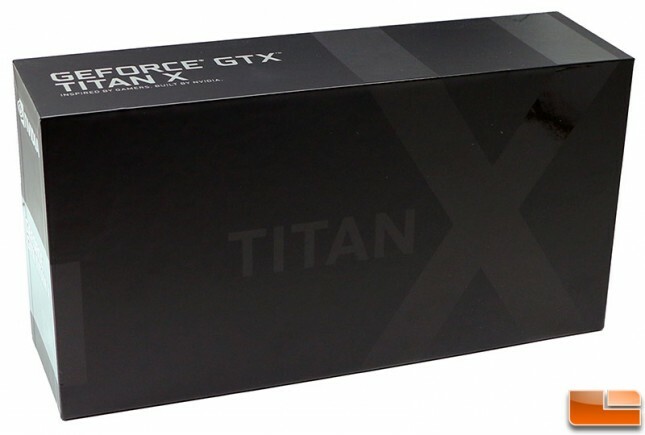 Our NVIDIA GeForce GTX Titan X video card showed up in the same black box that we first ran across when the Titan X was unveiled at GDC 2015. Unfortunately our sample was not signed with a personal message from NVIDIA President and CEO Jen-Hsun Huang! The product packaging was designed to lift off from the top and reveal the mighty GeForce GTX Titan X graphics card. The end result was basically a display case showing off the GTX Titan X in an upright position. 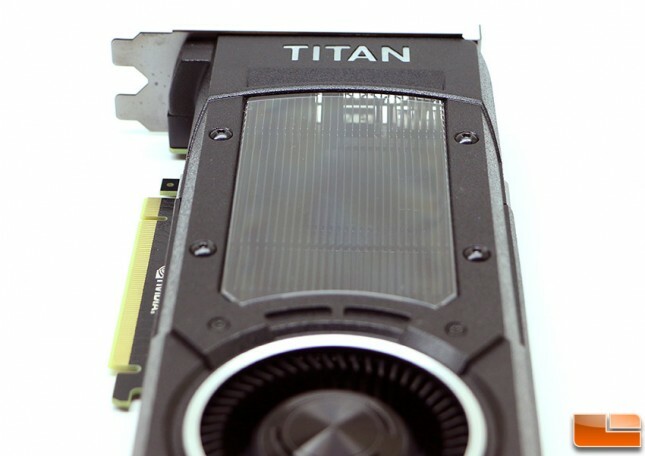 The blower style fan GPU cooler used on the GeForce GTX Titan X remains largely unchanged since first being used on the original GeForce GTX Titan in February 2013. NVIDIA isn’t getting complacent when it comes to GPU cooler designs, but rather said they came up with a good cooler and the TDP of their high-end discrete desktop cards has not really gone up. 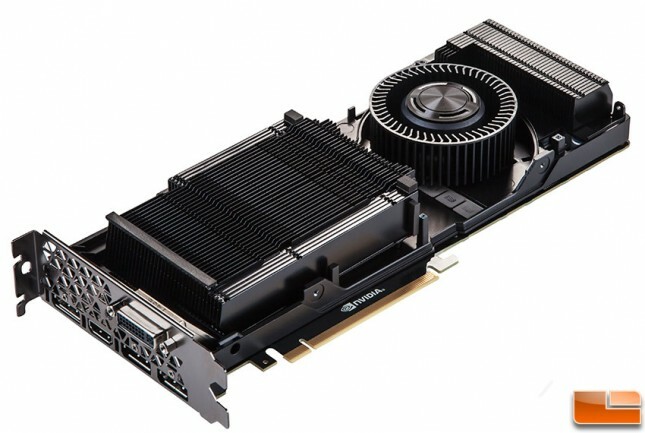 If you think about it the GeForce GTX 780, 780 Ti, and Titan were all 250W TDP cards, so why change the cooler if the temperatures and noise levels are good to go? The one thing we really like about the GeForce GTX Titan is that NVIDIA blacked it out more than another other GPU’s in recent memory! The Titan X has a magnesium alloy fan housing with an aluminum frame that was trivalent chromium plated to look as good as possible. The aluminum housing has been painted black to give it an aggressive look or stealthy depending on what camp you are in. The GeForce logo on top of the card is still LED backlit and glows NVIDIA green. The NVIDIA GeForce GTX Titan X reference card measures 10.5-inches in length and takes up two PCI slots. At just 10.5” long it should easily fit inside your current gaming system or any new chassis that you are looking to purchase for your next gaming rig. 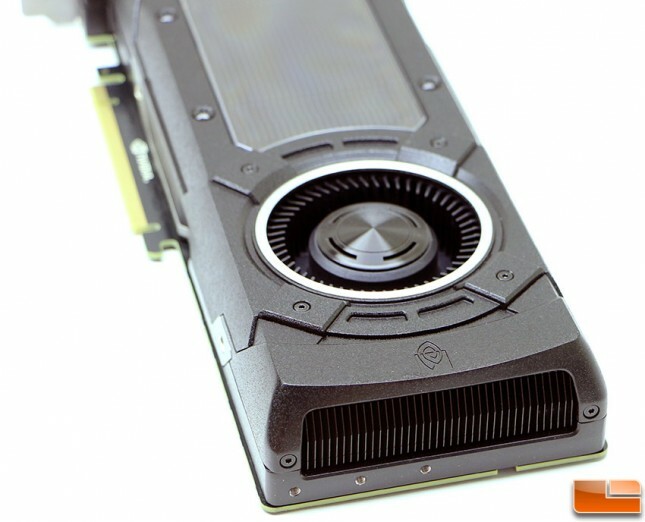 The blower style fan on the Titan X basically brings air in from the end of the card and the opening of the blower fan itself and then exhausts said air out the back of the graphics card and outside of the PC chassis. When looking down the aluminum cooling fins you can see that the air is blown right across the fins and out of the system. Under the fins you’ll find a copper vapor chamber that predominately sites on the GM200 GPU to effectively transfer heat away from the GPU and too the cooling fins. 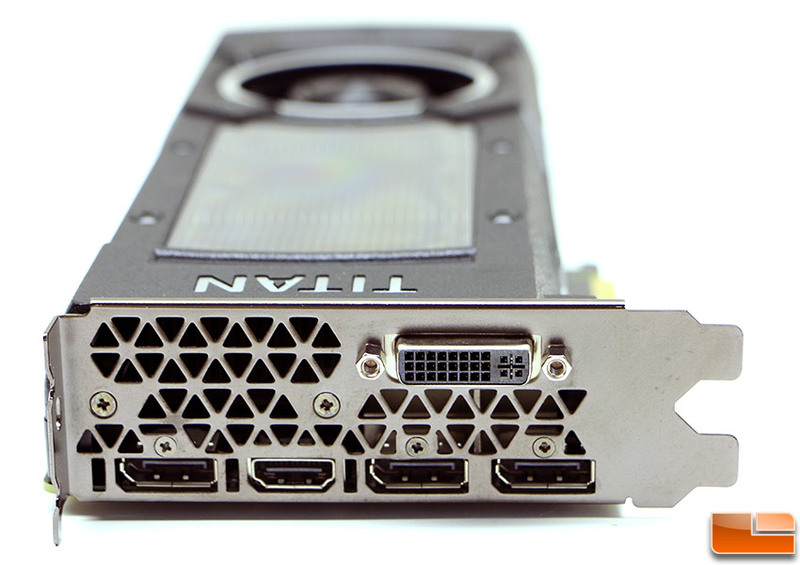 The video outputs on the GeForce GTX Titan X reference include three DisplayPort connectors, an HDMI 2.0 connector (supporting [email protected]) and a single dual-link DVI output. This means that NVIDIA now offers a total of five video connections, but only four can be used simultaneously. This new video output arrangement means that you can run three NVIDIA G-Sync enabled displays off of one GeForce GTX Titan Xvideo card if one desires to do so. If you want to run a multi-panel setup and don’t want to sacrifice any image quality, you’ll likely still need to run a 2, 3 or 4-way SLI multi-GPU setup to get the performance needed to power the resolution garnered by such a display setup. NVIDIA also changed up the way the exhaust ports are shaped on the I/O bracket to increase airflow and to reduce noise. The ability to support HDMI 2.0 is a pretty big deal and NVIDIA has the world’s first GPU that is able to support it. Previous generation GPU’s supported HDMI 1.4 and could only officially support 4k displays at 30Hz for ‘444’ RGB pixels and 60Hz for ‘420’ YUV pixels. 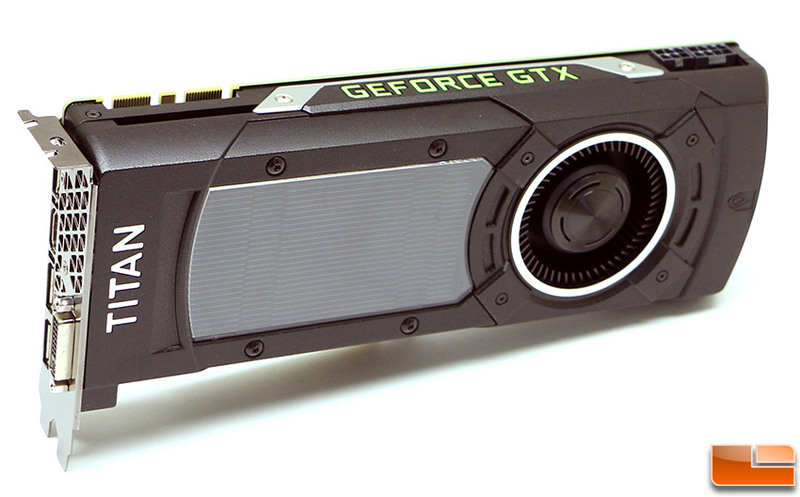 The GeForce GTX 970/980/Titan X support full-resolution ‘444’ RGB pixels at 60Hz for 4k displays. All GM2xx Maxell GPUs also ship with an enhanced NVENC encoder that adds support for H.265 encoding. NVIDIA claims that Maxwell’s video encoder improves H.264 video encode throughput by 2.5x over Kepler and that it can encode 4k video at 60 FPS. The max resolution supported by Maxwell is 5120×3200, so get ready for displays that go way beyond Ultra HD in the years to come! 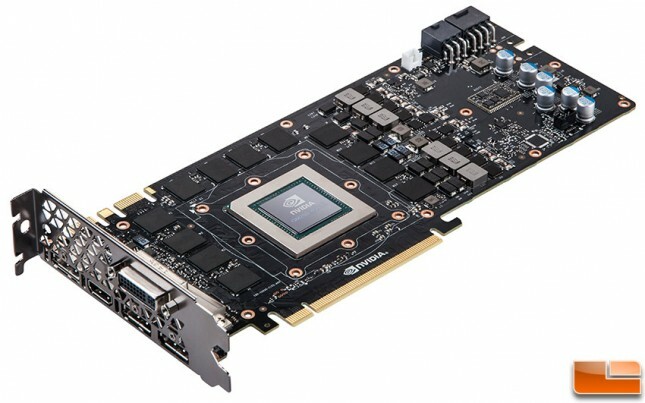 The NVIDIA GeForce GTX Titan X has a Thermal Design Power (TDP) rating of 250 Watts and requires one 6-pin and one 8-pin PCIe Power Connector for proper operation. 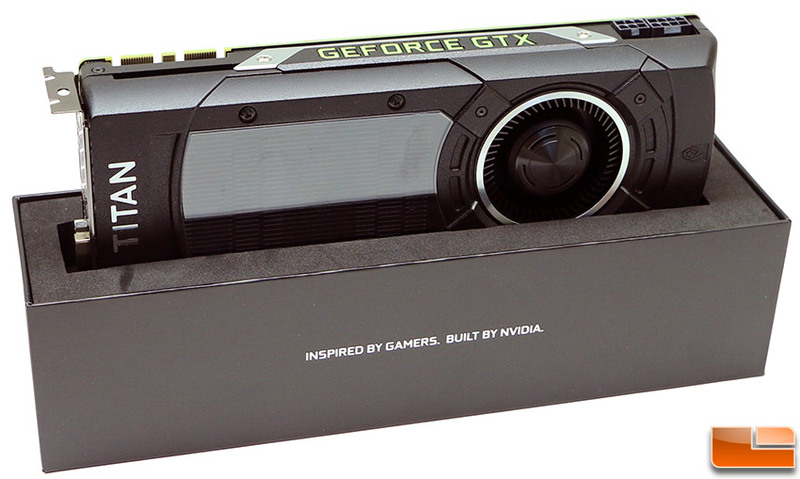 NVIDIA recommends a 600W or larger power supply for a system running one GeForce GTX Titan X video card. There is a physical location for a third 8-pin PCIe power connector on the PCB at the very end of the card, but it was deemed not needed for the GM200 and the solder points have gone unused. The NVIDIA GeForce GTX Titan X reference card does not come with a backplate. At first we were disappointed that NVIDIA did not include one, but they ensured us that one was not included to maximize the airflow for those wanting to run SLI. 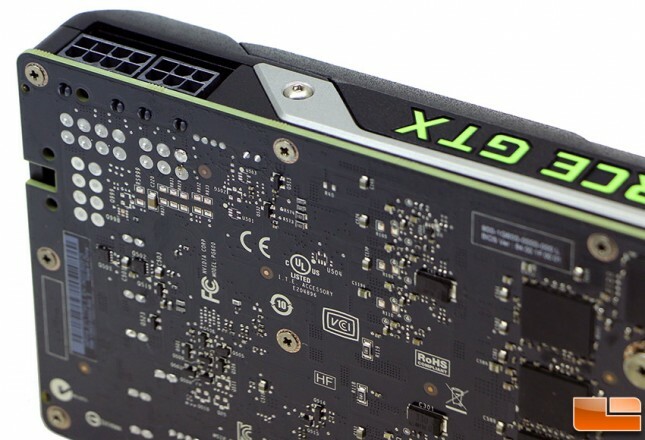 It would have been nice for NVIDIA to have included a fully removable backplate though as most gamers only run one card and like the looks and protection that a simple backplates can add to a graphics card. 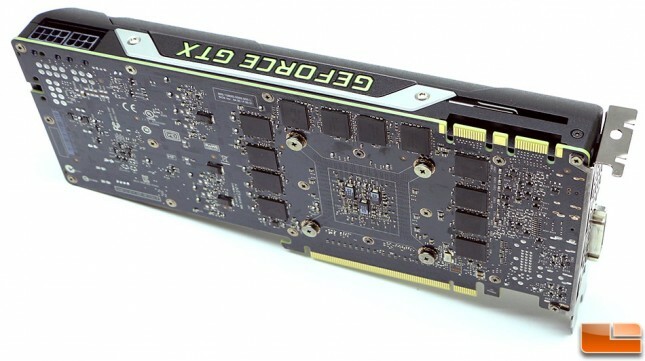 The NVIDIA GeForce GTX Titan X uses two sets of aluminum heatinks that has three embedded heatpipes that help keep the Maxwell GM204 GPU nice and cool. NVIDIA says that the default GPU Boost 2.0 settings will allow the GTX 980 to boost up to the highly clock frequency and remain there as long as the GPU temperature remains at or below 80C. Once you pull the CPU cooler entirely off you can see the PCB of the GeForce GTX Titan X reference card along with the GM200 GPU, GDDR5 memory ICs and the 6+2 power phase design. NVIDIA went with a 6-phase VR circuit with integrated dynamic power balancing circuity for the Titan X’s GM200 GPU and there is are two additional power phases for the boards whopping 12GB of GDDR5 memory. NVIDIA is also using polarized capacitors (POSCAPS) to minimize unwanted board noises as well as molded inductors for the very first time on a reference board. NVIDIA says that the 6+2 phase power supply setup has the ability to supply the GPU with 275W of power at the maximum power target setting of 110% if one would like to overclock the card. NVIDIA claims they were able to get the 3072 CUDA cores on GM200 GPU up to 1400MHz when overclocked with the stock air cooler.